It appears that the connection is being interrupted when trying to retrieved the modified QEMU binary from github. It is possible that connectivity to github was momentarily disrupted. Have you retried the ansible script and received the same error? Can you download the artifact (https://github.com/cmusatyalab/elijah-qemu/releases/download/cloudlet-v0.9.4/qemu-system-x86_64) from your browser without issue? Yes i retried and getting the same error 2nd time. If you do a wget and pass that URL, does it work that way as well? It is odd that you get stuck at the same step. It seems that this would be an intermittent issue. 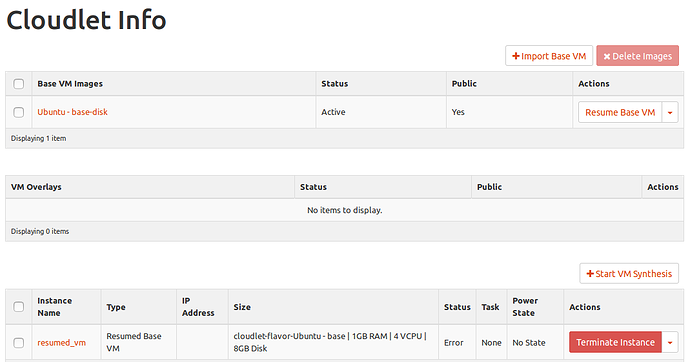 Just to verify, you are running Ubuntu 14.04? but downloading is very slow from this link, browser downloading interrupted 1-2 times. i,ve downlaod the binary, can we install it through that download file? 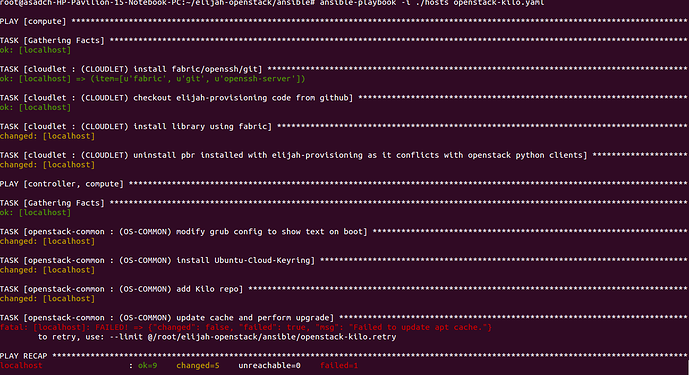 Further i'm running throught ansible one more time to ensure. Yeah it seems that there are some problems with your reaching this binary artifact. It looks like github hosts them in Amazon AWS. If you are able to manually download the file, you should be able to put it in to 'elijah/provisioning/lib/bin/x86_64' (this is a relative directory to the base elijah-provisioning directory which is probably in your home directory I would presume). If you can place the file there, you should be able to comment out line 72 of setup.py which is where it tries to download this dependency and then try to rerun the ansible script. Hopefully that would get you worked around the poor connectivity to AWS. If it moved beyond the 'install library using fabric' step, then it was able to successfully download the QEMU binary (since you didn't manually put the file there). Failing to update the cache could also be related to network issues as it would be contacting the Ubuntu repositories to check for new packages. Is it possible that you have some networking issues going on in your environment? You can try to execute the script again, but it may fail again. You could also try to manually execute 'apt-get update'. The evidence so far seems to suggest some general networking issue that is causing disruption. can we check the progress of ansible at which step it is now? Because i ran the command again and it is not giving any output from last 30 mins? It should be a relative directory to wherever you pulled down the elijah-provisioning repository from github. So likely /home/user/elijah-provisioning/elijah/provisioning/lib/bin/x86_64. Ansible should output the task that it is currently on. If it hasn't continued to a new task, there is possibly a problem. Is it stuck on the task of updating apt cache? Now it is stucking on this step again and again? It seems that because the apt-get update failed, your packages are in an inconsistent state. You need to run dpkg manually as it says sudo dpkg --configure -a and then hopefully it should fix the package state. successfully completed this step. Now proceeding with next step. how to create floating IP address, which address will be used here? So the answer can vary widely. It really just depends on your network and what you have at your disposal. If you are part of an organization/university that has a block of public addresses available, and they can allocate one or more of them to you, you can create a floating IP pool for your VMs for that range of addresses and then dynamically assign them to the VMs running in your Openstack environment. If you don't have additional external IP addresses available on your network, then you will likely need to do something more elaborate. For example, in our lab, we have a very finite amount of publicly available IP addresses and so we designated a single machine (with one of those few IPs) as the gateway to our cloudlet. On this gateway machine we run an OpenVPN server which hands out addresses in the 172.16.x.x range which we in turn use as the floating IP range in OpenStack. The physical hosts that sit behind this gateway have a default route that goes through the gateway and so when an VM is assigned one of these floating IPs, it can get out to the internet via the gateway and likewise, using a VPN client (like OpenVPN for Android) we can communicate with the VMs from the outside world via the OpenVPN server running on the gateway. Hope this explanation helps. This is one part of the setup that is wholly dependent upon the options available inside the network where you are running the cloudlet. Can we perform this step later, as right now i donot have an ip? 2ndly i import Base VM, but when i tried to Resume Base VM, it results in error status. Hi I am facing the problem during performing Step 6. Launch ansible playbook to install OpenStack. The screen shows the following msg for a long time. This step takes a few minutes to install the cloudlet library and its dependencies. However, if you are waiting 10 minutes or more, it may be stalled due to the fact that the fabric script requires a local username and password in order to install. Check that you have specified a valid local username and password in ansible/roles/cloudlet/vars/main.yml. ok thanks a lot for your reply. I stuck here for 2 hrs. Please let me know how I can setup username and password in ansible/roles/cloudlet/vars/main.yml. Is it using terminal some commands? or other? Please help me. I am new in ubuntu also. All you should have to do is edit that file with our favorite editor (vi, emacs, gedit) and change the local_username variable to be the username that you log into Ubuntu with. Do the same for the local_password varible: set it to the password for that account. These variables will then be used by the Ansible script at runtime when it launches the fabric script that is part of the TASK [cloudlet : (CLOUDLET) install library using fabric]. Note, there are other variables that you should change for the openstack-controller and openstack-compute roles as well. You should change all of these prior to launching the Ansible script. Refer to the step 5 of the README for elijah-openstack.